When the price is nice, who's to argue if a hotel has no room service? The select-service category--hotels that typically lack restaurants and offer amenities in moderation--has grown 38 percent in North America in the past six years, according to Smith Travel Research, showing that travelers are booking with an eye on the bottom line. Still, there's plenty of room for style, as seen by the proliferating Aloft brand from Starwood Hotels & Resorts, which has engendered the loyalty of entrepreneurs such as Todd Horton, founder and CEO of Cambridge, Mass.-based KangoGift, an employee-recognition company. "Where possible, I do choose Aloft over other options," he says, citing value, comfort and business-friendliness. He calls the open-plan lobby, trimmed in modern décor with fun features like pool tables, his "temporary office" for sales and networking meetings. Often, Horton will treat clients at the bar, and he considers the contemporary feel of the property a draw. "People these days enjoy meeting in a fun, well-designed space," he says. Style for less: An Aloft double queen room and courtyard. Founded in 2008 and a rising star among limited- or select-service hotels, Aloft will grow to 100 properties in 14 countries by year's end, with another 25 on deck for 2015. In part, the category was aided by belt-tightening during the recession, which boosted the appeal of competitors like Hilton Garden Inn and Residence Inn. Aloft seized on a classic opportunity: make a better widget. "When we looked at the category, it was pretty tired," says Brian McGuinness,Starwood's senior vice president of specialty select brands. "It was floral bedspreads and a pretty drab experience." Design. In addition to contemporary lobbies, guestrooms are streamlined, featuring platform beds and walk-in showers with rainfall heads. Technology. Free and fast Wi-Fi was just a start. The brand pioneered front-desk-free check-in for holders of its Starwood Preferred Guests card, using radio frequency to unlock doors. This year it launched keyless check-in in some locations, using smartphone Bluetooth technology. Wellness. In addition to well-equipped gyms, most locations have pools. Convenience. Grab-and-go delis offer 24-hour food options that change throughout the day. Diversions. Lobbies feature pool tables, tabletop shuffleboards and board games. Bars, which open when the workday ends, have proved so popular that management is adding food selections such as pizza. Analysts are quick to point out that Aloft, where rates start at about $89 outside Kansas City and go up to $269 in Harlem, isn't alone in innovating. Smith Travel Research reports that about 1,100 new hotels were added in the select-service category between 2008 and 2014, of which Aloft accounts for about 100. "There's room for Starwood to continue to grow Aloft in the select-service category, but they don't have the market to themselves," says analyst Henry H. Harteveldt, founder of San Francisco-based Atmosphere Research Group. Indeed, in September Marriott International launched its select-service Moxy brand in Milan, with a lobby conducive to gathering. Radisson plans to open its first Radisson Red next year, with a mobile application for check-in. Cambria Suites will introduce a new design next year featuring a socially oriented lobby bar. And Hyatt Place, launched in 2006 and now with more than 175 locations, was ranked highest in its category in J.D. Power's 2013 North America Hotel Guest Satisfaction Index Study. Growth, too, reflects demand. "Most travelers tend to stay in three- and four-star hotels not only in the U.S., but elsewhere in the world," Harteveldt says. Some Aloft guests have complained about the quality of food in the delis, small room size and lack of privacy. But many entrepreneurs appreciate the style-for-money value. Mark Jackson, president and CEO of Irving, Texas-based Vizion Interactive, a digital marketing agency, hosted a company summit at the Aloft in suburban Kansas City recently and describes the atmosphere as "perfect. The openness/boutique feel lent itself to creative thinking." In the airline world, activity in the fore cabins has been frenzied as new suites and lie-flat beds take aim at world travelers who are more interested in landing rested and ready than in pinching pennies. For the price-impervious, in December Etihad Airways will introduce the largest cabin-in-the-sky yet: the Residence by Etihad, a one-bedroom, butler-serviced, private suite with separate living room and bathroom with shower. The double-occupancy cabin, which will start at about $21,000, will appear on new Airbus A380s operating from London to Abu Dhabi. In 2015, the cabins will be on new aircraft offering service from New York to Abu Dhabi. 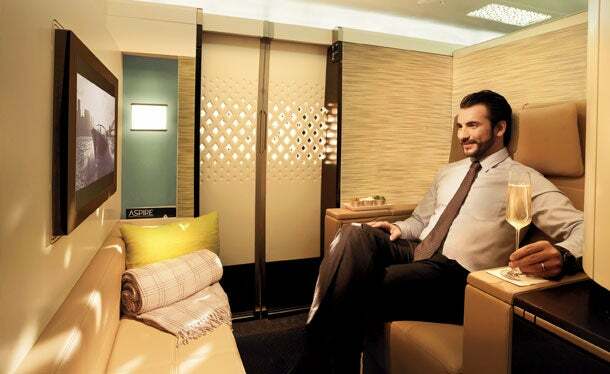 Analysts say competitors are unlikely to build their own dream suites in the sky--the newsmaking cabin is probably a loss leader--but may represent a gambit by Etihad to realign world traffic toward its home territory. "Etihad is trying to connect the world through Abu Dhabi," says Seth Kaplan, managing partner at Airline Weekly. "It seems like a strategy to dominate the world, rather than drive profits." --E.G.